On Sunday, Horncastle travelled to Rustons in the Lincoln Sunday League Division Three. Horncastle won the toss and elected to bowl first on a green, damp pitch. The Rustons innings never got going and they lost wickets at regular intervals. They were eventually bowled out in the 39th over for 109. 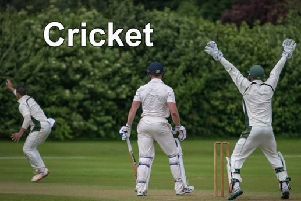 Jack Tate, Ed Applewhite and Lewis Lovegrove all picked up one wicket apiece, while Peter George produced a brilliant bit of fielding to run a batsman out with a direct hit. The stand-out bowlers were Tom Johnson, who bowled seven overs and picked up 2 for 7, and Rob Bee, who bowled eight overs to claim 2 for 11. Bee and Lovegrove opened the reply and got off to a good start reaching 35 before Bee was bowled by a slower ball for 22. Lovegrove followed, bowled for 12, which brought Ash Bullivant and Cameron Elliott together in the middle. Bullivant struck the ball well and found the boundary despite the long grass in the outfield. Elliott took up a different approach and went into full-on night watchman Test match mode. His rearguard action was just what Horncastle needed when Bullivant was caught for 21, bringing skipper Nick Hill to the crease. With rain imminent, Hill played some lovely shots to keep the scoring rate flowing. Elliott carried on his stern defence and these two carried on to the end to see Horncastle over the line and win the game by seven wickets. Hill ended 28 not out and Elliott seven not out, having batted for 23 overs.